Today I thought I would share with all of you some of my favorite sites, sounds, and experiences that I have enjoyed at the Walt Disney World resorts and parks. Most of the time, when we visit the Parks, my focus is on all of the big attractions — Space Mountain, Big Thunder Mountain Railroad, and all of the others. However, there are times when I want to focus on the things that don’t raise the adrenaline level to the roof, those sites and sounds that are part of the “road less traveled” at Disney World. So for today, we’ll take a look at my top five “sites and sounds” at the Magic Kingdom. Enjoy! Tom Sawyer Island is one of those attractions that you can just hop a raft over, wander around, go through the cave, follow the paths, and just chill. For those that are camera buffs, Tom Sawyer Island will provide some great photo locations for the Big Thunder Mountain Railroad, so get those cameras ready! However, for me, the real fun with Tom Sawyer Island is just watching Sophie explore all of the different parts of the island, especially the caves — she really gets a kick out of immersing herself into the story, as if she really is going to find Injun Joe! Walt Disney World Railroad is one of those awesome attractions that just let you and your family really relax and enjoy a real working train as it takes you on a scenic journey around the edge of the Magic Kingdom. The two stops for the WDW Railroad are at Main Street, U.S.A. and Frontierland. This is another attraction that will lend itself towards getting some great photographs of different areas of the Park that you may not think about otherwise. The Carousel of Progress is one of my all time favorite shows to see, and watching it in it’s unique circular theater is a really neat way to get away from the Florida heat and take a relaxing trip into the history of America’s progress. I don’t know about all of you, but there is really something neat to me when I see the scenes from America’s past portrayed for all of us. It’s really kind of funny, but every time I see CoP I immediately think of the Thornton Wilder play Our Town. The Carousel of Progress is one of those attractions that I make a point of seeing at least once every trip to Disney World. For years and years, I avoided seeing Wishes or any other fireworks show at any theme park. I even stayed away from fireworks during the 4th of July celebrations. The noise from the exploding fireworks was just something that I had a hard time with. But then, in 2008, we finally had the bright idea of purchasing two sets of ear plugs — one for me and one set for Sophie — and let me tell you, it was like we had blinders taken off of our eyes. Gone was the fear and trepidation of the fireworks shows, and all of a sudden Sophie and I (my wife has always loved the fireworks) were HUGE fireworks fans. For me, Wishes is one of my all time favorite fireworks shows, and we experience it at least twice when on a trip. This year we are going to experience it at the Magic Kingdom, and from the rooftop of Bay Lake Towers, and maybe even — if we get lucky in our room placement — even from our balcony at BLT! Now, I know that Wishes can be an adrenaline builder, especially when they get to the climax of the show. But it is a great show to see, so don’t miss out on it! The Main Street Electrical Parade is, for us, the ultimate parade in all of Walt Disney World. I remember seeing the Electrical Parade when I was younger, and Cindy and I saw it in the year 2000 (at least, my memory remembers seeing it – please correct me if I’m wrong!) — and when it returned last year as part of the “Summer Nightastic!“, it was like meeting your long lost friend you hadn’t seen in 10 years. It was just as great as it was last time we saw it, but simultaneously, it was also better because of the improvements in technology that they have now. I am really excited that it has been extended without any end date, and can’t wait until I see it again in June! So now you have my top five sites and sounds that I can’t miss at Walt Disney World. Some of the sites and sounds are laid back, some are more exciting, but none of them are to be missed in my opinion! What are you top sites and sounds that you have to see at the Magic Kingdom? About a week ago I posted for Chip and Company an article outlining the differences between the Tables in Wonderland program and the Disney Dining Plan, and which one is better. Since this year we will not be doing the Disney Dining Plan, but instead are going to utilize the Tables in Wonderland program, I thought I would post it on my blog as well. So, without further review, I give you Tables in Wonderland vs. Disney Dining Plan. A recent discussion came up the other day that we thought would be interesting to explore. 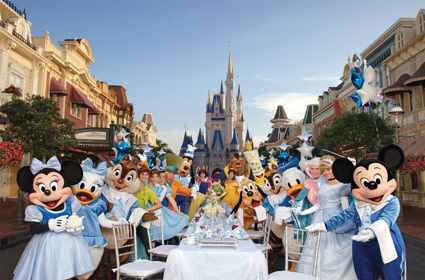 Which is better: Tables in Wonderland (and out of pocket expenses) or signing up for the Disney Dining Plan? 1. The TiW card can only be purchased by a person that has an annual pass, or by a Florida Resident. 2. The card costs $75 for Annual Passholders, and $100 for Florida Residents. 3. As I mentioned, the TiW program will discount 20% off of all your food and drink purchases (including alcohol) at many of the Walt Disney World restaurants, but not all of them. 4. The TiW card can be used for the cardholder and up to nine guests dining with the cardholder. 5. An automatic 18% gratuity is included when using the TiW card, regardless of the size of the party. 6. If you are thinking of buying the TiW card, you need to do some research to make sure that the discount will be at least equal to the cost you are paying for the card. 1. For the regular DDP, you will receive one snack, one quick service meal, and one table service meal per day. 2. With the DDP, you must select the plan for every day that you are visiting Disney, and the DDP is only available to people that are staying on a Disney property. 3. In addition, each member of your party needs to be on the dining plan. You can’t pick and choose. 4. You get one credit for each of the types of meal (or snack) for each day. You can choose to use all of them in one day, if you like, or you can space them out so that you have credits for each day. For my family, we have always had the regular Disney Dining Plan. There have been times when we got it for free based on when we came down on vacation, and there have been times when we paid for it. This year, though, things are different. Last June we became Disney Vacation Club owners, and as a result, this year we are staying at Bay Lake Towers, one of the DVC resorts available to us. The room that we reserved is a 2 bedroom suite, and will sleep 9 people, which is the number of people in our party. As a result, we made the decision really quickly that we were going to pay for our meals out of pocket. Our room has a full kitchen, so as a result, we are planning on only having three sit down meals during our visit. If we had wanted to do the Dining Plan, it would have cost my family (I am responsible for 5 of the guests) $1,371.65 for our stay, and it would have cost my sister-in-law’s family $1,049.72! If we did the quick service plan, it still would have been about $1,800 for the two families combined. While I don’t have the final tally of what our costs for dining will be, I’m going to make a conservative estimate that we would save at least $750 by going the OOP/TiW route over what we would pay for the DDP. When we get down there, I’m going to keep our receipts, and work up the final numbers after we get back! Thanks for reading! Tonight I want to show you some of the pictures I’ve taken over the years of the signature structures of Walt Disney World: Cinderella Castle, Spaceship Earth, Sorcerer Mickey’s Hat, and the Tree of Life. Out of all of the pictures, my favorites tend to be the ones that get the most distictive lighting applied to them. Can you pick out my favorite? Comment below, and tell me which one you like! By the way, when it comes to my photos, if anyone ever wants to use one for a blog post or anything like that, please feel free to borrow it! Just shoot me an email at mydreamsofdisney@gmail.com and let me know (and preferably, include the link so I can help you publish it on Twitter) and have at it! Now, on to the photos! I hope you enjoy! First up is Magic Kingdom, with it’s signature structure, Cinderella Castle! Next on our tour of the signature structures is Epcot, home to Spaceship Earth! Now for my photographic shortfalls. 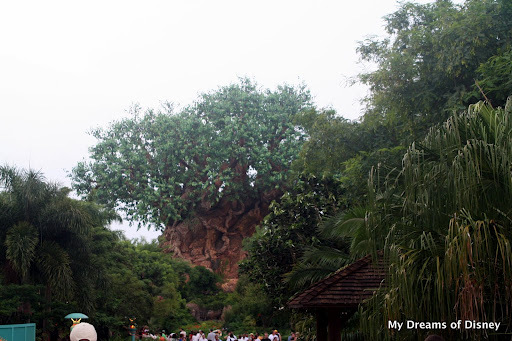 You will notice that I only have a couple of both the Sorcerer Mickey hat from Disney’s Hollywood Studios and the Tree of Life from Disney’s Animal Kingdom. Looks like I need to correct that on this next trip down! So tell me please — which one is my favorite do you think? And which one do you like? 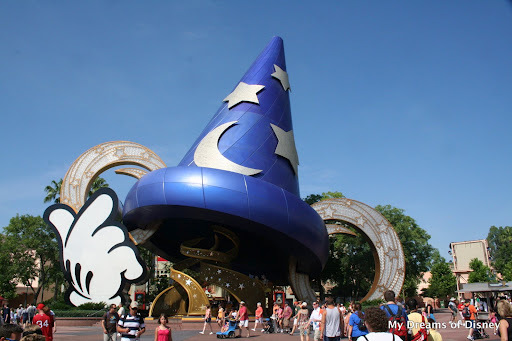 I hope you have enjoyed this photographic journey to Walt Disney World’s signature structures! Check back next time where I’m going to take a look at exploring Disney World on the “roads less traveled” — that is, the sites and scenes that people overlook as the focus on the big attractions! See you soon!